On June 16, 2007 BZN gave their last concert. Therefore the BZN fan club ceased to exist on January 1, 2008. It is no longer possible to become a member of the fan club. Also the mailing address and the bank accounts are no longer valid. During the 42 years of BZN a lot has happened, also at the fan club. 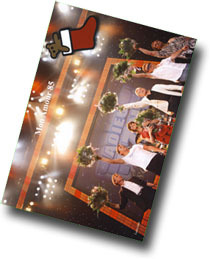 The last issue of the "Mon Amour", the name of the fan magazine, is number 85 and appeared in December 2007. The fan magazine got this name in January or February 1979 (the month cannot be exactly determined). But "Mon Amour" number 1 was the not the first fan magazine for BZN! On February 27, 1968 the first issue of "BeZeteN", a stenciled fan magazine for BZN, appeared. The fan magazine had the known sections like the concert agenda and record news. Of the stenciled fan magazines six appeared in total. The last one appeared in December 1968. That was not the end of the fan magazine, however, but it changed into a printed booklet. Under the name of "BZN Fanblad" in February 1969 the first issue of the first year of publication appeared. The first year four issues appear and during the second year three. From 1971 for three years every year two double issues appear, and in 1973 the last double issue appears of the "BZN Fanblad": the 5th year of publication, numbers 3 and 4. In total thirteen booklets of the "BZN Fanblad" appeared. In August 1974, the first fan magazine of the United Volendam Fan Clubs appears, a cooperation of the fan clubs for BZN and the Fools. It was the intention to issue six of these booklets a year, but this first issue is also the last. Then it remains quiet for a long time, till a new untitled fan magazine appears in 1978. This is the first magazine from the period with Annie Schilder and the last fan magazine before the series of "Mon Amour". In total the BZN fan club issues 106 booklets during a timespan of a little less than fourty years! In the business card of Mies Dienin the titles "Duizend keer" and "Niets is mooier" are hidden. In the business card of Melanie Vanorri the titles "Melodie d'amour" and "L'anniversaire" are hidden. The answer of the large puzzle is quite appropriate "TIME TO SAY GOODBYE".